"What you're doing doesn't fit into the category of real-time news." This was how journalist-cartoonist Joe Sacco's application for a press pass to visit Gaza got rejected. And there's a good deal of truth to this statement. 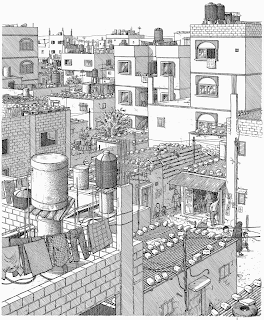 Sacco spent five years working on Footnotes in Gaza -- far too long for those of us who waited for new work from the most underrated of all modern comic book creators. Granted other artists and writers may have had more influence over the medium, but few can be credited with creating a genre almost single-handedly. Of course, comic book journalism is hardly popular, though its credibility slowly creeps forward. Sure it will probably not save journalism. But in a world in which fiction is far too dominant -- I need not even comment on "reality" TV -- attempts to uncover the truth are inherently worthy. And when done in comic book form, efforts become valiant. In my view, at least. Footnotes in Gaza is in some way an accidental sequel to Sacco's monumental Palestine series. But the differences between the two works are considerable. Whereas Palestine was largely journalistic, Footnotes is almost scholarly. Sacco is not engaged in mere reportage in the book, but with historical investigation, with uncovering events that have been overshadowed by more important events. Here's where our man encounters some predictable criticism. First, there's the simple fact that any investigative work undertaken in Palestine based largely from the Palestinian perspectives is by definition controversial. Sacco is doing much more than this. His work focuses on massacres committed by Israeli forces against Palestinians in 1956. Good luck with that. But Sacco -- who I suspect is sympathetic to the Palestinian cause -- strikes a remarkably objective tone. Due to the lack of documentary evidence of the events that occurred in Rafah and Khan Younis, Sacco must rely entirely on the memories of Palestinians who witnessed the incidents. Sacco does not naively accept the credibility of these recollections. Rather, he delights in presenting the often contradictory memories of the residents of Khan Younis and Rafah, or pondering the reliability of memory and even of history itself. Footnotes in fact demonstrates more critical distance, skepticism, and wariness in the face of memory than do many works by social scientist who all too often privilege the subaltern for the sake of being pomo. That's enough about the politics of it all. Sacco's art is at its finest in Footnotes. His characterizations remain purposely ugly. People in Sacco's pages grimace and frown, they look uncomfortable, angry, and frightened. Then again, Sacco's protagonists live in the kinds of places that will piss a person off and make them grimace all too often. Beyond his exaggerated cartooning of the human form, Sacco's minimalist photorealistic landscapes deserve immense praise. Clean, sparse lines and precise perspective accentuate the griminess and hopelessness of life in southern Gaza. I do have one criticism: Sacco's disjointed storytelling. I claimed above that Footnotes in Gaza is more an academic than a journalistic endeavor. Well, that's only partly true. Much of the book details Sacco's experience researching the incidents, thus it reads at time like a memoir. Overall, the back-and-forth transitioning between these experience and the reconstruction of the 1956 events is effective. It provides the reader with a stark understanding of the deeply entrenched nature of the Palestinian conflicts. But at other times, particular in the Rafah chapters, these transition impede the narrative telling of the incident. This is a minuscule criticism, one made for the sake of criticism itself. 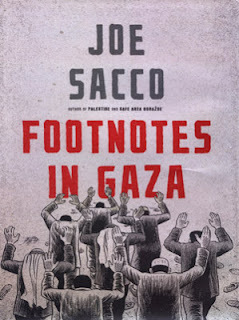 Joe Sacco's Footnotes in Gaza is quite simply an important work, an indication of the heights to which comic books can aspire. Yeah, I actually wrote that. Cross-posted at Bullets and Ballots.